The Cinderella Girl (a.k.a. 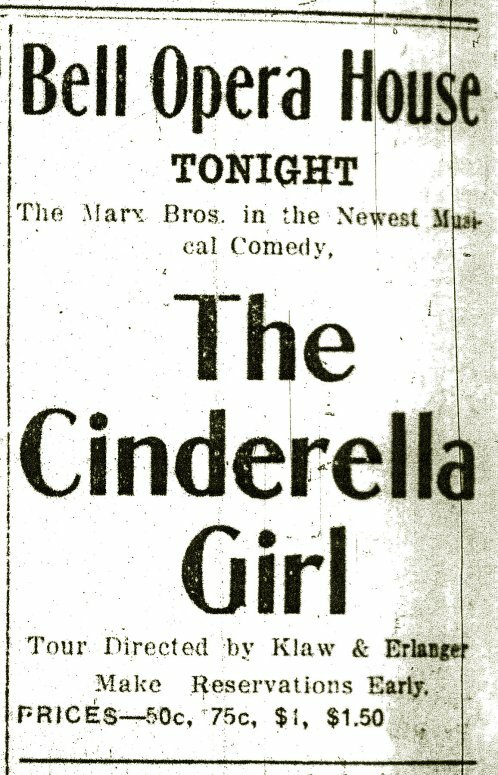 The Street Cinderella) was one of the few fiascos the Marx Brothers ever experienced. The show was written by Jo Swerling (who also wrote the script to Humor Risk) and featured songs by Gus Kahn and Egbert van Alstyne. Few details are known about the show but a contemporary notice describes it as "a love story of a couple of street singers". Jim Dalgleish, night editor with The Herald-Palladium Daily newspaper in Benton Harbor, Michigan, has recently found several newspaper ads for the show. One issue had a photo of the chorus girls and the ads said it was "a new farce comedy in three acts ... beautiful girls, beautiful music, beautiful love story." 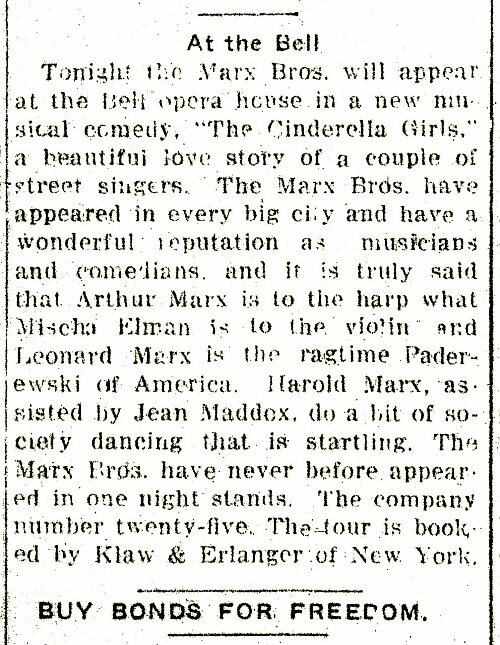 One ad said it was presented by Minnie Palmer and included critics blurbs from Chicago, another said the brothers "really know their business". The show opened in late September 1918 in Grand Rapids, Michigan (although Charlotte Chandler says in her book Hello I Must Be Going that the show "opened and closed in Battle Creek, Michigan"). This was during the Spanish influenza epidemic and since local health regulations allowed the theaters to sell only every other seat and every other row there was no chance whatever of merely breaking even at the box office. The premiere was awful and at the beginning of the second act, Groucho stepped forward and said: "Folks, that first act wasn't so good. We're gonna ad-lib from now on." In The Marx Brothers Scrapbook by Groucho Marx and Richard Anobile, Groucho said it "was a terrible act and we realized that we couldn't play it successfully". The internal balance of the group was also changed at this time since Gummo joined the US Army and was replaced by Zeppo. Zeppo says in The Marx Brothers Scrapbook that "my mother called me up to tell me that Gummo was leaving for the army and that she wanted to keep the name The Four Marx Bros. intact. She insisted I join the act and that's what I did." In his Marx Brothers Encyclopedia Glenn Mitchell adds that the brief, discouraging engagement in Grand Rapids was followed by "five indifferent days in Benton Harbor, closing on 3 October". 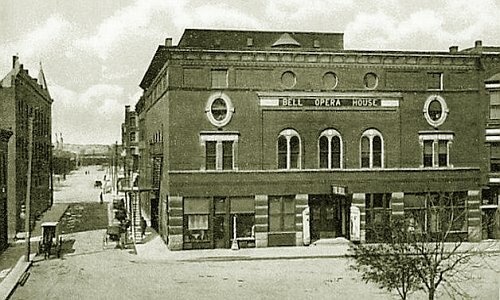 These performances took place at the Bell Opera House in Benton Harbor, Michigan. According to the chronology section in Simon Louvish' book Monkey Business - the Lives and Legends of the Marx Brothers, the show played into November. This was possibly somewhere in New York City (see notice from The New York Clipper) and it may have been during this later run that the show was renamed The Street Cinderella. 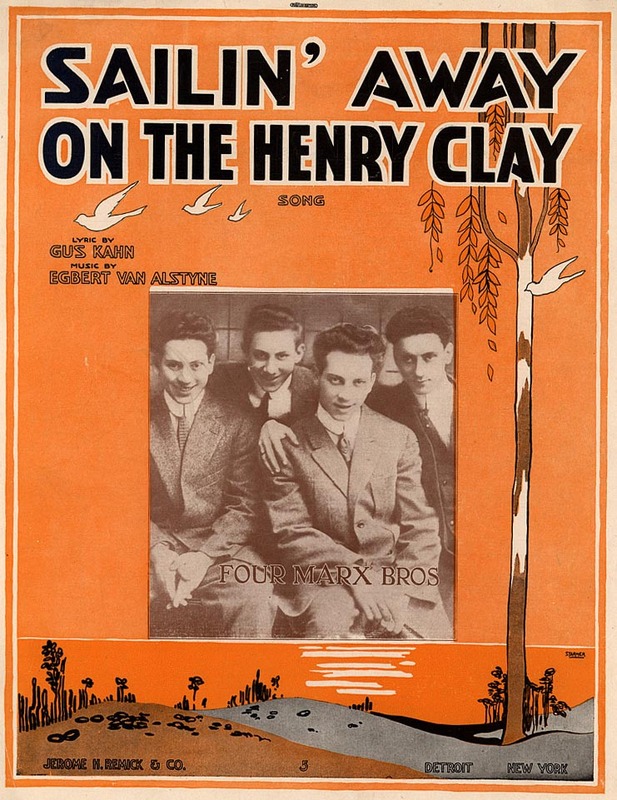 At least one of the Cinderella-compositions by Gus Kahn and Egbert van Alstyne may have been salvaged when Cinderella flopped, namely Sailin' Away on the Henry Clay, which was published in 1917 and appeared in later versions of Home Again. Grace Kahn, the wife of Gus, mentions the song in Charlotte Chandler's book Hello, I Must Be Going when recalling her days as a song plugger for Chicago-based music publisher Jerome H. Remick; "Now, at this point Groucho was doing an act in Grand Rapids, something in vaudeville, so my boss sent me to Grand Rapids to get Groucho to sing a song when he arrived in Chicago. Groucho liked the song, and when he got to Chicago he sang it." Chandler asks if Grace remembers the song she were plugging for Groucho, to which Grace replies. "Yes, I certainly do. Sailin' Away on the Henry Clay, that was the name of the song. They'd travel around the country for about a year in those days, and Groucho kept the song on for all that time." Gus Kahn died in 1941 but two years later his and Grace's daughter Irene married Groucho's son Arthur. Groucho remained friends with Grace for the rest of his life and they also had grandchildren Steve and Andy Marx in common. Some other Kahn/van Alstyne-titles found on the net also fit chronologically as Cinderella-leftovers, like I Can't Get Along Without You (copyrighted in 1918) and You're In Style When You're Wearing a Smile (with words and music by Al. W. Brown, Gus Kahn and Egbert Van Alstyne). For Your Boy and My Boy was published by Remick and used in a Liberty Loan drive to sell bonds in order to support the allied in World War I. It was performed by Al Jolson and reached No. 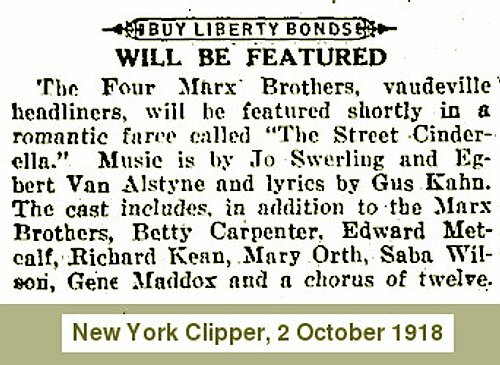 4 on the top 100 US songs of 1918 with a recording by the Peerless Quartet. The prophetically entitled What Are You Going To Do To Help The Boys was published in 1918 (also by Remick) while Your Eyes Have Told Me So (written by Kahn/van Alstyne together with Walter Blaufuss) appeared in a 1919-movie called Sing Me A Love Song (which - by the way - was filmed again in 1936). In November 2001, I was in contact with Jo Swerling Jr, the scriptwriter's son, but he couldn't shed any more light on Cinderella. In an e-mail, he wrote: "During my early years, I had the pleasure of being with Groucho and Harpo on many social occasions with my parents. Groucho was always "on", while Harpo, not unlike his on-screen persona, was much quieter and more reserved than his brother. Unfortunately, my father didn't leave anything in writing about his friends, the Marx Bros., nor do I recall any verbal anecdotes that aren't available in books or articles already published about them. I do remember one occasion when we were having lunch with Groucho at Nate and Al's, a legendary Beverly Hills delicatessen. Groucho turned to a middle-aged woman in the next booth and politely asked her if he could borrow a pencil. Of course, she recognized him and happily handed him one, which he then used to poke a hole in the end of one of his signature cigars before lighting it. He then handed the astonished woman her pencil back. I've often wondered if she kept it as some sort of hallowed celebrity artifact. ".